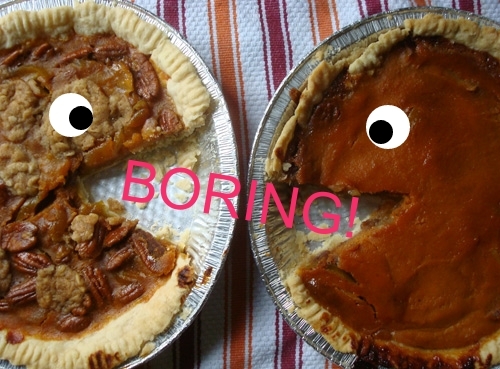 I need to state it directly: it is my firm belief that Thanksgiving pies are boring and overrated. Don't get me wrong. They are entirely pleasant. They are worthy of respect. They have meaning, both historically and nostalgically. I can appreciate that. But seriously. Am I the only one that considers them the final barrier, a frumpy and dull diversion leading up to the real sweetness of the season: Christmas cookies? But I have taken efforts to remove the personal connection to bring you a detailed laundry list of why each pie is overrated. 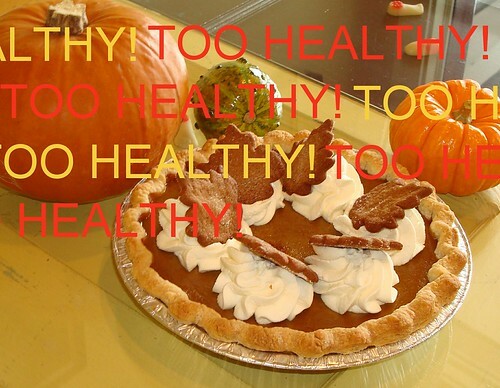 Let's start with Pumpkin pie. For one thing, it's entirely too virtuous. If you look at the classic Libby's recipe, there's something important missing from the recipe: BUTTER. Sure, you may argue, it's got sugar and milk and eggs and stuff, but I say it doesn't matter. Butter makes it better, and this pie is alarmingly devoid. Add to the fact that it can often be gummy and tastes more like spice than anything else, and you've really just got a vehicle for the whipped cream topping and crust, which should have butter. Or lard. And don't even get me started on Sweet Potato Pie. Talk about a pie with no personality other than that of the spices which impart flavor and a texture that is just downright weird for a dessert. Sweet potato ought to be relegated to side dish material only. It's way too healthy to be a pie, unless it's a breakfast pie. Apple pie, that symbol of hearth and home, needs to stop pretending to be dessert. 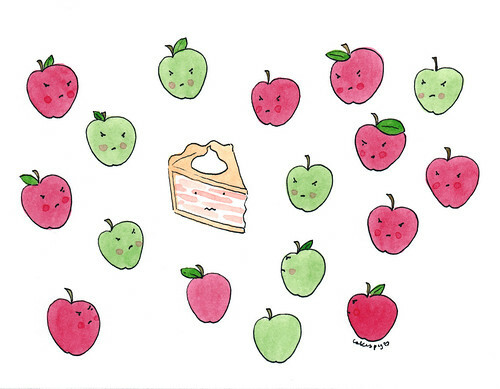 What Apple Pie is, is health food. Apples are too virtuous to be considered dessert, and your butter and sugar would be better used in a batch of cookies. With apple pie, the best part is the crust and the crumb topping. Pecan pie is on the right track, what with the corn syrup and butter, but is really more of a tooth-number than anything of real interest. Would it kill you to add something--anything--to offer a little flavor contrast? Some chocolate, some cranberries...something. Also, not that I want to get petty or anything, but as a general note, Thanksgiving pies are just downright homely. Sure, they have a certain je ne sais quoi just out of the oven, while cooling, but you try and show me a pie that's good-looking once cut into. Nope--it all turns into a lumpy landscape of beige and orangey earth-toned stuff. Christmas cookies, on the other hand, really know how to liven up a table. In festive colors with sparkling sugar and sprinkles, these little nuggets of pure decadent joy form a village of deliciousness when displayed on the dessert table. And we're indulgent. We're full of butter and love and joy, all in easy-to-pop-in-your-mouth-sized servings. We're like the holiday equivalent of the Fun-size candy bar: bet you can't eat just three. 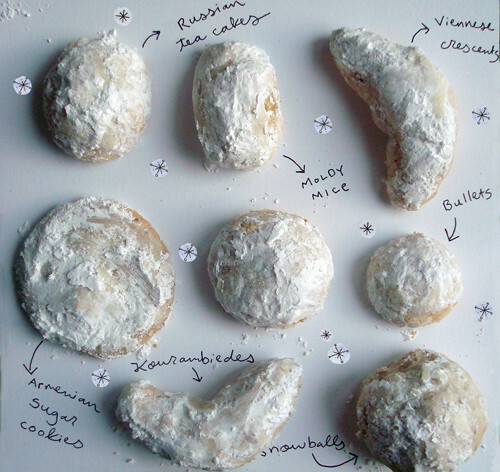 Christmas cookies are bountiful, are pretty, are playful in a way that pies will never be. So, in closing, let me say that I get it. I know I'm not going to change the world with a mere letter to the editor. We all have to pay homage to the tradition of Thanksgiving pies. After all, they are representative of the earth from which our feast comes from, a symbol of survival in the new world. And it's really a rather nice tradition. But to the cookie enthusiasts out there, those who find the pies, well, just a litting boring--you are not alone. I know that you're all really looking forward to the cookies, and it's only a few days til the season really begins. I'd like to make it clear to my readers that your point of view is not intended to be the CakeSpy point of view on the matter. While I can agree that cookies make for a splashier dessert spread visually, we must pause to appreciate the pie. Plus, cookie, you might find that you have more in common with pie than you think. In fact, one of the first cookies my mom used to make during the Christmas season was actually made using the crust from the Thanksgiving pies, which she'd brush with butter and cinnamon-sugar and roll up. Good gravy were those things good. Here's a recipe that is similar. 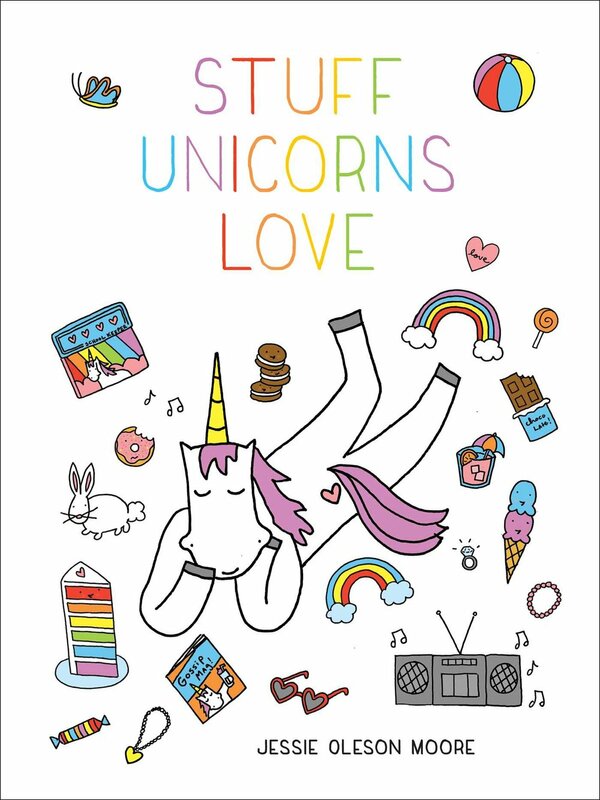 I think that's proof that we can all get along and co-exist deliciously.